Hours ago we wrote about the leak of a Nexus 5 handset in an Android 4.4 KitKat video from Google and now there’s already a concept phone based on that. The device was created by Yugatech and can be seen below. In case you’ve been sleeping for the past 20 hours or so, Google confirmed that the next Android release will be version 4.4, codenamed KitKat. They also leaked a video of a prototype phone that seems like a gigantic and slim device, with squared edges. Some eagle eyed journalists have apparently spotted an LG logo at the back, in the leak, although frankly speaking, I haven’t. Interestingly the Nexus logo is horizontal, like on the Nexus 7 and the Nexus 10 and the camera looks huge. It could be the same sensor used on the LG G2, a 13 MP shooter. 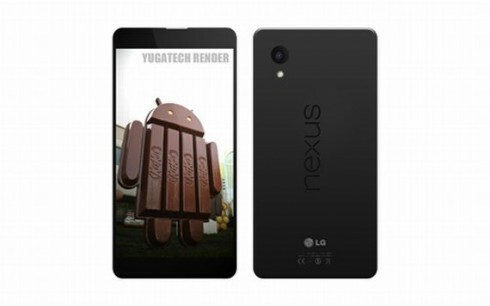 Rumors say the Nexus 5 will have a 5.2 inch edge to edge Full HD display, a Snapdragon 800 CPU and Android 4.4 as the OS, plus 2 or 3 GB of RAM.